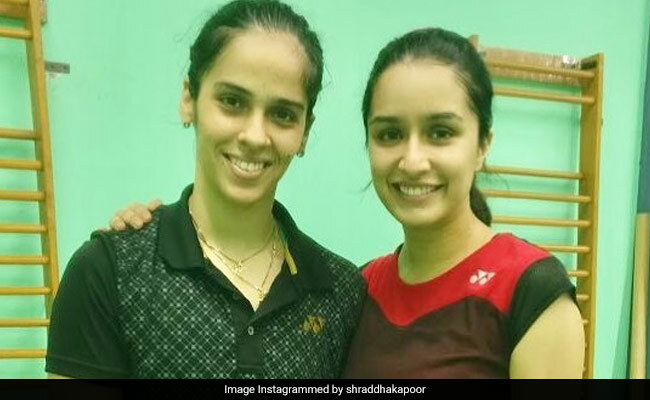 Shraddha Kapoor, who is basking in the success of her film Stree, has already begun shooting for the biopic on badminton champion Saina Nehwal. Shraddha, who is playing the titular character in the film, has undergone rigorous training for her role and is keeping no stone unturned to prepare herself. Shraddha had met Saina's parents when she visited her residence last year, told news agency IANS that meeting them was a "really nice" experience. "Saina's parents gave lots of love to me and they treated me like a family when I visited their home, so, it felt really nice to see them here," IANS quoted the actress as saying. Shraddha Kapoor had also shared photos from her visit to Saina's home in Hyderabad last year. Today at @nehwalsaina 's home. Being pampered by aunty. She made delicious poori,choley,kheer,halwa & a fruit/milk juice. Shraddha, who started shooting for the film last week, said that Saina Nehwal's parents had come down to visit them on the sets. "When Saina's parents came here to visit us, then it felt like my parents had visited us on the film set," the actress added. "I feel very lucky to be part of this film and to be seating along with these respected people." Shraddha had earlier posted pictures from her training session with Saina and her coach Pullela Gopichand. The biopic announced last April will be directed by Amole Gupte. When the film was announced, Shraddha shared her excitement with her fans on social media. She shared a picture of Saina Nehwal and captioned the photo: "Saina Nehwal, the former world no 1 badminton player, an Indian girl, an inspiration to millions, a youth icon in the truest sense. Her journey to the top has been fascinating and I am honoured to be given this opportunity to play her in my next film Saina. The preparation for this film is going to be very, very challenging. It's probably going to be my most difficult film till date. Wish me luck everyone." Meanwhile, Shraddha Kapoor's film Stree, which released last year is doing remarkable business at the box office. The film has raked in over Rs 119 crore. Speaking about the success of the film, Shraddha said: "I am very happy that the film is doing really well. I am thankful to the entire media and audience because they supported a content-driven film and it feels really good as an actor being part of such film." Shraddha Kapoor also has Sujeeth Reddy's Saaho in the line-up, which also stars Prabhas.